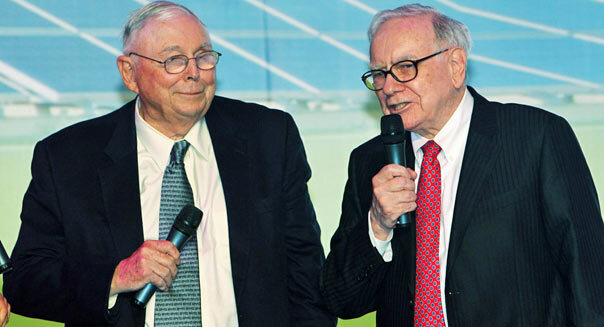 ChinaFotoPress/Getty ImagesBerkshire Hathaway vice chairman Charles Thomas Munger, left, and CEO Warren E. Buffett attend a conference in Beijing in 2010. This weekend, somewhere in the neighborhood of 40,000 capitalists will make what has become their annual pilgrimage to the investing mecca normally known as Omaha, Neb., On Saturday, Berkshire Hathaway (BRK.A) (BRK.B) hosts its annual meeting, and the investing world will listen with rapt attention to the words of wisdom of the company's leaders: Warren Buffett and Charlie Munger. The admission ticket to be a part of this event that has become known as "Woodstock for Capitalists" is available for free to anyone who owns at least one share of stock in Berkshire Hathaway. An "A" class share will cost you about as much as a house -- $160,857 as of Thursday's close. For those of us who aren't the multimillionaire type capable of dropping a hundred grand (and then some) on a weekend getaway, "B" class shares are also available, closing Thursday at a more pedestrian $107.30. What's on everyone's minds this year? Question No. 1: Who will succeed Buffett and Munger -- now age 82 and 89, respectively -- to lead the company when, by choice or by force of nature, they move on? It's an important question to ask, since the company has achieved so much mainly because of those two men at the top. They possess an incredible -- and rare -- combination of investing prowess, patience with a long-term perspective, and operational discipline that has allowed Berkshire to become the powerhouse company it is today. Unless all three qualities can be found in the company's next generation of leaders, the Berkshire Hathaway 10 years from now will look nothing like the one that investors know and love today. The temperament to stick to a long-term time frame is a critical skill for the leader of the Berkshire operation to possess because Berkshire Hathaway is a conglomerate of largely independently operating companies. As Buffett has said, "Charlie [Munger] and I are the managing partners of Berkshire. But we subcontract all of the heavy lifting in this business to the managers of our subsidiaries. In fact, we delegate almost to the point of abdication." Many people who get to CEO level of a company do so because they're strong managers. The temptation would be incredibly strong for a CEO candidate to put his or her stamp on the brand and fiddle with that unique recipe that got Berkshire this far. Yet if companies no longer feel like they can be acquired by Berkshire and be put in the corporate equivalent of the "Metropolitan Museum" (to forever have a wing unto itself) to continue to run independently, Berkshire will lose its ability to get such great pricing for solid businesses. Additionally, two of Berkshire's key qualities are its rock-solid balance sheet and its prodigious cash-generating abilities. Those were made possible by Buffett's and Munger's long-term focus and operational discipline. A CEO more accustomed to the "make the quarter's numbers at any cost" mentality of most public companies would be easily tempted by that cash. After all, even Berkshire Hathaway under Buffett posts losses every once in a while. Many of those losses could have been avoided by a manager with a short-term mentality and a willingness to make a quick deal. But that short-term thinking would likely have destroyed billions in long-term value. The next Berkshire CEO must be willing to put the long-term health of the company ahead of the short-term quest for the next quarter's profit target, or else the company will lose its ability to compound over the long term as efficiently and effectively. Question No. 2: How can the company continue to outperform, now that it has gotten so big? And if it can't, isn't now the time to start paying a dividend? Under Buffett, Berkshire Hathaway has grown. A lot. Yet the bigger a company, the bigger its deals need to be to effectively move the needle. The company has underperformed the S&P 500 over the past four years, and if it underperforms this year, it'll be the first time in the company's history under Buffett that it underperforms the market for five years. If Berkshire Hathaway has gotten so large that the world's greatest investor can't reliably steer it to beat the market, then what chance is there for any other mere mortal to do it? In the absence of a consistent market-beating growth plan, the logical choice is to initiate a dividend. That would allow shareholders to retain their ownership of a still incredibly strong Berkshire Hathaway while freeing up money to either invest elsewhere or spend. Still, given Buffett's reputation as a dividend collector rather than dividend payer, along with his ability to still manage Berkshire's portfolio better than anyone else, that question may be one that will have to wait for his successor. If history is any guide, neither of those questions will likely be completely answered in this weekend's Berkshire Hathaway annual meeting. Still, the experience pays a unique homage to American capitalism and one of the greatest investing teams of all time. It's worth the price of admission, especially since you get a stake in one of the world's strongest companies along with your entry to that event. Motley Fool contributor Chuck Saletta has no position in any stocks mentioned. The Motley Fool recommends Berkshire Hathaway. The Motley Fool owns shares of Berkshire Hathaway.